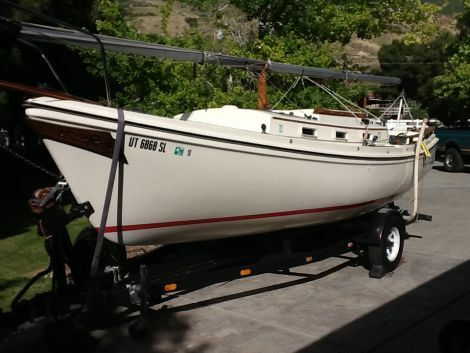 Swing keel w/newer winch (18 inches up 5/5 feet down), Custom made sun/rain cockpit awning, pulpit, custom cockpit cushions, life vests, plush cushion type PFDs, fenders, dock lines, emergency paddles, spare tiller, dingy motor mount, swim ladder, numerous extra lines, two boat hooks, porta potty, portable stove, 8lb. Danforth type anchor with marked line and bag, pop-top cabin 2/ custom surround (six foot headroom), newer main and jibs, older 130% Genoa, new storm jib, colorful spinnaker, Three reefs in main with jiffy-reefing gear and boomvang. rebuilt trailer with radial tired, heavier axle with electric brakes, extended tongue, brake washout, redwood bunks and spare tire. Clean boat. Well loved. Ready to sail.